To draw a Bald Eagle, start by studying the photo here. You'll note that the head and body are composed of mostly oval shapes and curved lines. Proportion and eye placement are important. As you draw, you'll want to be aware of the size of the head in relationship to the body and the length of the wings in proportion to the height of the eagle. Keep the initial construction lines light so you can cover them or erase them from your finished drawing. To complete this drawing you will need a number 2 or softer pencil and a piece of bond or drawing paper. If you wish, you can use colored pencils, paints, or markers to add color to your finished sketch. The body is a slightly elongated and tilted oval shape that is wider at the top than at the bottom. Sketch the oval in the center of your paper, leaving room above the oval for the head and neck and below it for the legs, feet, and tail. You'll also want to sketch in a curve to represent the branch upon which the eagle is standing. The eagle's head is much smaller than its body. Sketch an oval approximately one-fourth the height of the body above the body oval. Note that the head is placed at a downward angle in relationship to the body. The lines for the beak overlap the oval for the face. Sketch two curved lines that come together as a long point facing downward. Sketch a straighter line for the bottom of the beak; the line should be almost parallel to the line that makes up the top of the beak. Sketch an oval for the nostril. The nostril is situated high and close to the bird's head. The eagle's eye expresses the character and spirit of the bird. Sketch in a crossed line to help with the placement of the eye in the front third of the head, and about a third of the way from the top of the head. Then draw an almost straight line for the eagle's brow line and about three-quarters of a circle for the eye. Eye placement is very important, so take time to make sure it looks just right. The straight black line makes the eagle appear to be glaring or looking intently. Darken in the pupil, but leave a white highlight to give the appearance of reflected light. The bottom of the pupil rests on the horizontal line that you used to help in placing the eye correctly. Shade in around the front of the eye to give it depth. Draw a small oval at the top of the oval for the eagle's body, which will eventually illustrate the extent of the white head feathers. Draw two slightly concave lines at the front and the back of the head, connecting the head to the body, to make up the eagle's neck. Create another oval on the right side of the body, connected to the back, to outline the bird's wing. Add a point to the bottom of the wing oval. Extend a narrow rectangle downward from the back of the bottom of the body to sketch in the tail. Add two semi-circles extending from under the wing and opposite side of the body to create leg feathers. 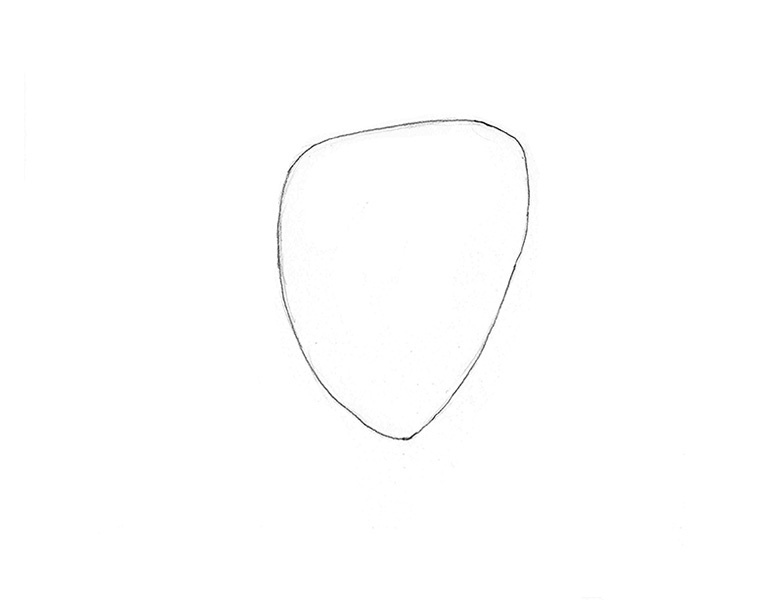 Sketch in the general shape of the foot closest to you with a long, curved oval. The oval will rest on top of the rock or branch on which the eagle stands. Connect the oval for the leg to the leg feathers using short curved lines. Sketch another curved line for the distant leg. Add toes to the feet. Draw a sharply curved talon on each toe. Use rough, jagged lines to create the feathers along the lower edge of the oval you created for the head feathers. Add downward pointing, rounded V shapes for primary wing feathers. Use longer curved lines to define body and leg feathers. Use longer lines to form the tail feathers and for the ends of the wings. Create downy feathers around the legs by using short, sketchy lines. Finish adding in feather details and shading to add more dimension. Draw details for the branch or rock that the bird is sitting on. Add other background details and color if you wish. Keep looking at images and practicing to perfect your technique. You may want to add other birds and wildlife to your repertoire as you develop both your observation and drawing skills.